A couple of weeks ago the Brazilian community at New York’s Our Lady of Pompeii Church held its annual barbecue, to which the members pitch in to buy meat and drinks – some bring more soda, beer and wine to share, and it is a day-long event that goes on quite late. I got there really early, and it was already dark by the time I left, and some girls were still dancing to the groove of “pagode,” a popular take on samba with humorous lyrics and an uptempo beat. 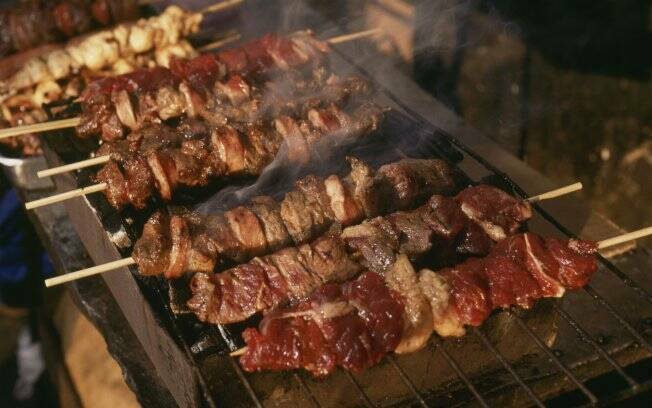 If you have ever been to a Brazilian steakhouse, you know that it is all about the meat – beef is immensely popular there, especially picanha, or rump cover (also known as top sirloin cap in some places), but they are pretty equal opportunity – during the cookout there was plenty of sausage and chicken alongside green salad, rice and of course the inevitable “farofa,” a side dish made with cassava flour – traditionally, you dip your meat into eat before eating it. Readers of this blog know that I am into vegetarian cooking even though I am not exclusively vegetarian, so I decided to introduce the group to an alternative dish – tofu skewers in an orange marinade that I learned about a few years back – a recipe created, believe it or not, by Pamela Anderson (yes, that Pamela Anderson) . It is quite easy to prepare, since all you have to do is prepare the marinade and the skewers a day early and just lay them on the grill for a few minutes. When I brought the prepared skewers to the cookout, I must say I was a bit skeptical of the reaction. I had made them before using an indoor grill and got a mixed response from guests that tried it, but then again two of them were avowed meat lovers. Of course, using charcoal makes a big difference, so I knew that the flavor would be much better. Also, I changed the recipe a bit, including some Dominican mojo criollo (found in the Latin section of many supermarkets) to give it more of a kick. To my surprise, most people present thoroughly enjoyed my contribution. Some seemed skeptical at first, but after they took the first bite it was like a new discovery – one of them liked them so much that she went back for more until they were all gone. I made about 30, and they had all been consumed within an hour. Many who tried were asking me about the recipe, and those who came too late were also asking me about it. I guess I will have to enlist Renata next year to help me make more of those – they were a healthy and meat-free alternative.